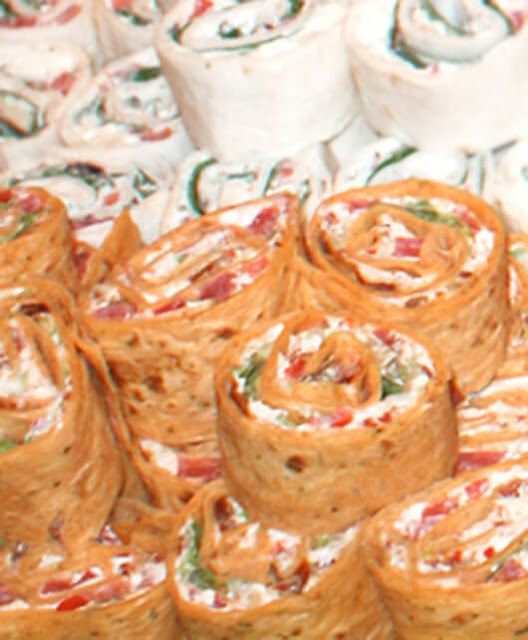 Bacon, Lettuce, and Tomato Pinwheels is an easy to make recipe that makes a great appetizer, lunch or snack! For my daughter's second birthday party I wanted to serve a variety of small, kid friendly, sandwich-y type items. These little pinwheels fit the bill and were delicious, too! They're easy, versatile and didn't leave me stuck in the kitchen cooking during the party. I prepared them a day ahead of time and would honestly have to say that I preferred them fresh. After being in the fridge overnight, the lettuce had (predictably) wilted a bit and the cream cheese was a little too thick from being cold. I wouldn't hesitate to make them again, I would just be sure to make them the same day I plan on serving them. The tortillas can obviously be swapped for another flavor to suit your tastes. In the photo above you can see that I also made Greek Pinwheels on plain tortillas that were equally as tasty. You gotta try these! 1. In a small bowl, combine the cream cheese, mayo and sun dried tomatoes. Stir in bacon. 2. Spread the cream cheese mixture on the tortillas. Top with chopped plum tomatoes and lettuce. 3. Tightly roll up the tortillas and, using a serrated knife, cut into 1 inch slices. Nutrition information is provided as a courtesy and should not be considered a guarantee. Please see our full Nutrition Data Disclosure here.